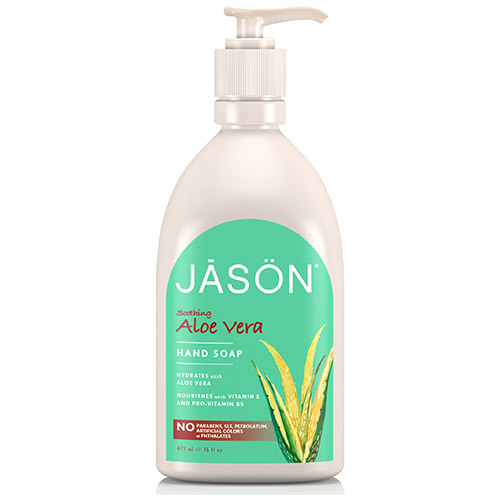 This botanical hand soap gently cleanses and safely nourishes your skin with vitamin E and pro-vitamin B5. A blend of soothing aloe vera, sunflower seed and wheat germ oils provides lipid relief to smooth and hydrate your skin. Aqua (Water), Cocamidopropyl Betaine, Sodium Lauryl Sulfoacetate, Aloe Barbadensis Leaf Juice*, Glycerin, Calendula Officinalis Flower Extract, Salvia Officinalis (Sage) Leaf Extract, Spirulina Maxima Extract, Helianthus Annuus (Sunflower) Seed Oil*, Triticum Vulgare (Wheat) Germ Oil, Allantoin, Panthenol, Tocopheryl Acetate, Lauryl Glucoside, Stearyl Citrate, Sodium Sulfate, Sodium Chloride, Citric Acid, Benzyl Alcohol, Potassium Sorbate, Sodium Benzoate, Benzyl Benzoate, Hexyl Cinnamal, Fragrance (Parfum). Pump soap into hands. Wash hands as usual. Rinse thoroughly. If rash or irritation occurs, stop use and consult a physician. 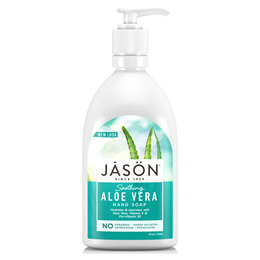 Below are reviews of Jason Soothing Aloe Vera Hand Soap - 473ml by bodykind customers. If you have tried this product we'd love to hear what you think so please leave a review.